My husband and I enjoy a little antiquing trip now and then. We live in an area filled with great antique and thrift shops. 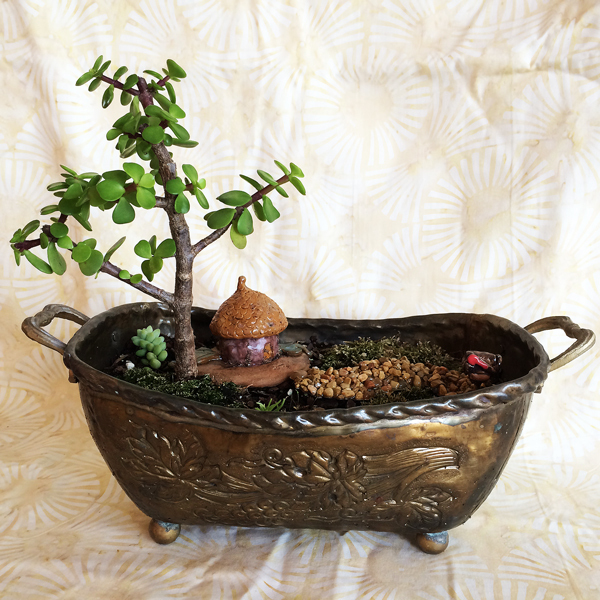 We found this old metal container at a flea market and I couldn’t resist making it into a fairy garden. My husband drilled a couple of small drainage holes in the bottom of the container. Then I added some potting soil, a miniature jade “tree”, a couple of very tiny succulents, which will grow much larger, a pathway, and a tiny mailbox from my collection. 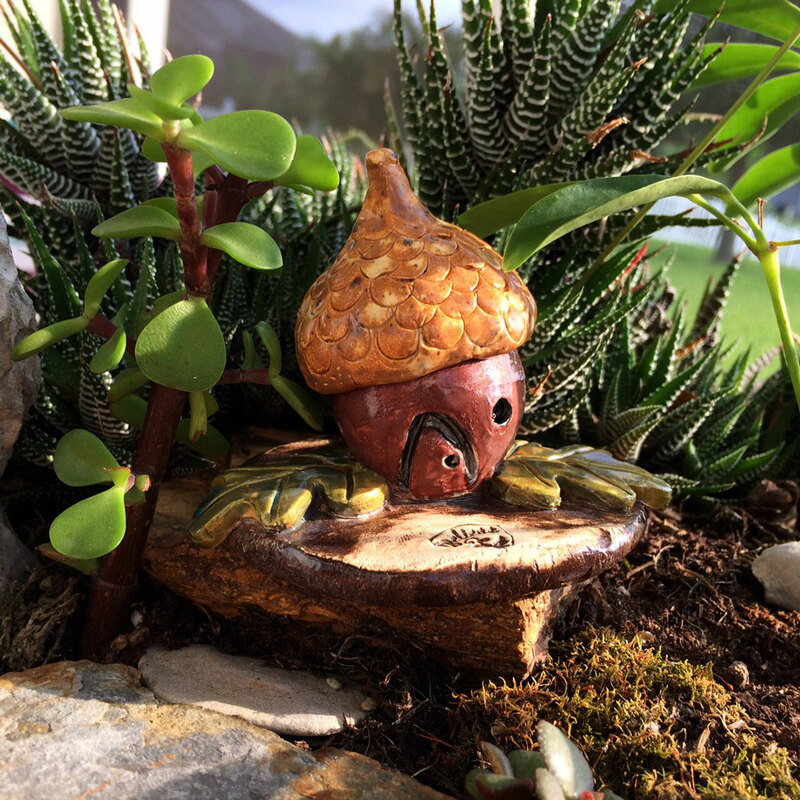 The little acorn house seemed perfect nestled in at the base of the tree. I added some moss that I collected from my own backyard and here is the result. I like to use the miniature jade for “trees” because it is very hardy, grows quickly, and is easy to shape. I simply snip off the new growth at the tips of the branches now and then. I also remove any green from the base of the trunk and main branches. This pruning encourages new growth and controls where the growth happens. Eventually the plant will fill in and the trunk will grow much thicker. As it grows the shape becomes more and more like a tree in the small scene. Living in Florida is a challenge as the heat can sometimes be very hard on the plants. Succulents are a good bet for their ruggedness. I keep my gardens on the east side of my house so they get some morning sun, but are not too stressed by the hot afternoon sun. This also helps the moss to stay green. Moss likes shadier conditions and so I keep the soil moist, not wet, and free from harsh sun most of the day. As the garden matures the moss will fill in, the plants will develop and the house will look more at home in its environment. The houses, pathways, and mailboxes are available on my etsy shop. If you are a subscriber to my newsletter you will receive valuable discount coupon codes for my shop four or five times each year. I roll out new designs a few times each year and I retire the older products. I love to hear from you so please feel free to comment or contact me.